We captured a version of I-1000 petition form on August 31st. As you can see, its languages are completely different from what AG approved I-1000 ballot title and ballot measure summary. Initiative Measure No. 1000 concerns affirmative action and preferential treatment. This measure would allow government to implement affirmative action that does not constitute preferential treatment in public employment, education, and contracting in certain circumstances and would define affirmative action and preferential treatment. groups and to implement affirmative action, without the use of quotas or preferential treatment (as defined), in public education, employment, and contracting. I-1000 people are completely unethical. 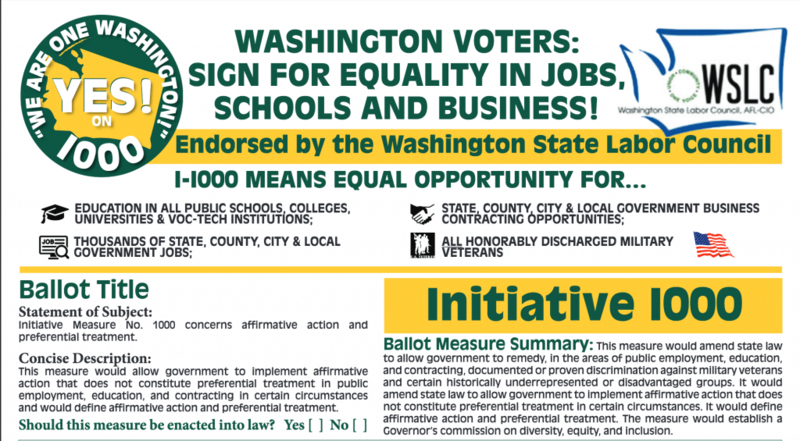 They played dirty tricks to mislead people in order to gather signatures. And then, they tried to cover up their lies using stickers? How disgraceful those people are! I-1000 should be completely disqualified. The 30th District Republicans are on your side against I-1000. Our Chair is Jim Stiles 253-312-1711 and email is chair30thwagop@gmail.com. We want to help on the NO on I-1000 campaign in the 30th District.